Designer Inpsired- Brazilian Aquamarine and Boi Ploi Black Spinel Pendant in Platinum and Black Rhodium Plated Sterling Silver 14.750 Ct.
Have you ever wondered just how spectacular would it be if you could get the diamond clarity in pale blue hue? If you have and you’ve been looking everywhere for that picturesque beauty, your search ends here. Our selection brings the priceless sparkle with the soothing and soft blue colour. Paired with fabulous faceting, these pieces will steal your breath and leave your admirers agog. Come and take a look at the treasured and coveted collection of the best aquamarine pendants. The metaphysical presence of aquamarine has always been given the highest regard. Like most other crystals, it has been used an ideal cleaning power source. It induces positivity in the wearer. And the best way to harness that is by wearing it an aquamarine pendant. Other than that, the stone has been regarded as “The Stone of Courage and Protection.” In simple terms, aquamarine jewellery instils a sense of self-confidence and realisation in the wearer, which aids him/her into verbal confidence. The healing benefits of aquamarine have been recognized and consulted by many healers and believers across the globe. Aquamarines look ethereal if there’s a halo drawn around them. So, we took that idea and gave it more richness. Our aquamarine halo pendants have made rounds of fame and appreciation for their illustrious and reverent presence. 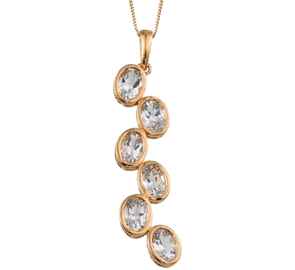 With a mesmerizing reflective surface, these pendants call for all the gasps of admirations and gushes of envy. We believe that aquamarine is a single stone enough to transfix your senses. So, our solitaire aquamarine pendants have their own class of posh brilliance set to suit your regal tastes. With their idyllic hue and out-worldly element of reflection, these stones look right out of treasure, even if studded alone at the base of your neck. Shopping for authentic aquamarine pendants online in UK is like looking for the cure of cold. You’ll find an overwhelming number of options, but there’s only little way knowing where you’ll get the best selection. It’s where TJC comes to your rescue. We offer you an unparalleled selection of the best aquamarine pendants in UK. With new and novel designs flaunting the ravishing blue-hued excellence, these adornments are unique in all ways that count. In fact, the use of matching or contrasting pure gold (rose, white, yellow,) platinum, rhodium, silver, and more only heightens their appeal. Don’t stop your shopping binge just here! We have a lot more to offer you, and not only in this gemstone. Scroll and browse through the scoping horizon of our breath-taking collection of jewellery, which features stunning lays of rings, earrings, pendants, necklaces, and so much more at reasonable and pocket-friendly prices.